Dec. 10, 2014 | LITTLE ROCK — University of Arkansas for Medical Sciences (UAMS) Myeloma Institute’s Bart Barlogie, M.D., Ph.D., recently was honored with the Lifetime Achievement Award from the Chicago Chapter of the Israel Cancer Research Fund (ICRF). 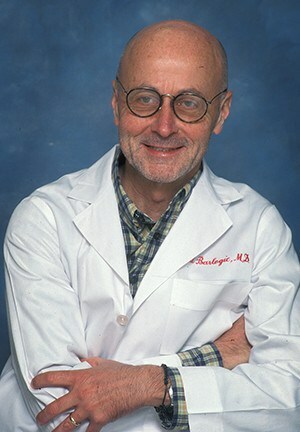 Barlogie is a UAMS College of Medicine distinguished professor of medicine and pathology and distinguished clinical scholar. He holds the Tommy May Chair in Oncology and is the founder and former director of UAMS Myeloma Institute. His reputation has led patients from around the world to travel to UAMS to be treated at the institute. The Myeloma Institute is an international leader and treats more patients with multiple myeloma and related diseases than any other facility in the world. Barlogie chose to step down as director in June to focus on clinical care and research, concentrating on those patients who have a more adverse prognosis based on sophisticated molecular analyses, of which he was a leading developer. The Israel Cancer Research Funded, founded in 1975, is the largest organization in North America devoted solely to raising money for cancer research in Israel. Gifts to the fund have provided about $52 million in funding to more than 2,100 research projects that have led to many advances in cancer treatment. Technion-Israel Institute of Technology, Haifa, Israel. Ciechanover won the Nobel Prize in Chemistry in 2004 for the discovery of ubiquitin-mediated protein degradation. That discovery led to the development to the drug Velcade, which is used in treatment regimens at the Myeloma Institute.